Hey guys! I have another Art Challenge for you: Painting with Nail Polish! 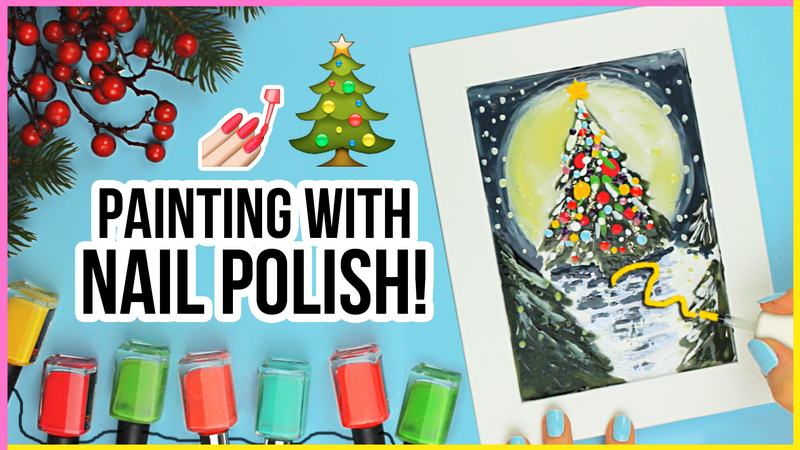 I’m going to create a Christmas tree painting using Nail Polish! There are different Art Challenge ideas out there, like drawing with makeup, but I wanted to try how it is to paint with Nail Polish and how to use cosmetics as art supplies to create easy Nail Polish Art that you can hang up your wall to decorate your room! But it is also a unique and original idea for a Last Minute Christmas or Birthday Gift for your friends and family! There are a lot of videos about nail polish DIYs, nail polish art, nail polish designs and nail polish hacks, but I haven’t seen that many videos about how to paint with nail polish to create nail polish art that you can actually use to decorate your room! And since it’s Christmas and Holiday time, I decided it would be a fun idea for an art challenge to try out this new art challenge and paint using nail polish!